All transactions are safe and secure with a reliable history in online purchasing behind each of our associates. 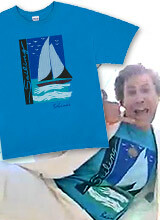 Buy the Brennan's Boats N Hoes t-shirt to own Step Brothers clothing and merchandise. Help out the newest Prestige Worldwide recording artists Huff and Doback by grabbing this Boats N Hoes t-shirt that Brennan Huff wears under his white suit while filming the music video to promote their future hit single. The raunchy lyrics are sure to stick in teenagers' heads for years to come. Come on...be charitable. They really need some money to pay for the boat they wrecked making their awesome music video. Boats N Hoes, I gotta have me more boats and hoes! In addition to the Brennan's Boats N Hoes tee above, browse the Step Brothers Clothing Gallery for more apparel like men's and women's clothes, kids shirts or hoodies.